When it is wildlife in Assam someone is talking about, the cue is primarily on Kaziranga National Park having proud association with Great One Horn Rhinoceros. Unlike other national parks in India that generally attract wildlife lovers through orange and black striped felines, Kaziranga comes into picture whenever mighty rhino is discussed in numbers though the boasting the highest density of tigers as well. If one wants to see two wonders of nature at a single place, it could only be this park. The lands of Golaghat and Nagao districts were made in to this national park in 1974, renouncing its past that was associated with hunting. Due to being the home of the world’s highest population of the Rhino species, the park was declared a World Heritage Site in 1985 to facilitate the eco-balance needed for the thriving of the species. On arrival at Guwahati airport meet with our representative and drive to Manas National Park. On arrival check in at the wildlife resort. Overnight at resort. Manas: Situated on the foothills of the Himalaya, in the north bank of the Brahmaputra river, in Assam, Manas lies on the international border with Bhutan. Manas is the most stunning pristine wildlife habitat in India, comparable to the best in the world in the beauty of its spectacular landscape. It is bounded on the north by the Royal Manas National Park in Bhutan, on the south by populous North Kamrup district and on both east and west by buffer forest reserves which are part of 2,840 sq. Km Manas Tiger reserve. It was created as a project tiger reserve in the year 1973 and declared national park in the year 1973. It is also a UNESCO Natural World Heritage (in danger) site, a Project Tiger Reserve, an Elephant Reserve and a Biosphere Reserve - a unique distinction. This Brahmaputra Valley semi-evergreen forest Terrestrial Eco-region is also the richest in species of all Indian wildlife areas and the only known home for the rare and endangered Assam Roofed Turtle, Hispid Hare, Golden Langur and Pygmy Hog. Morning and afternoon game drive to the national park for wildlife viewing. Overnight at resort. Morning after breakfast drive back to Guwahati. On arrival check in at the camp. In the afternoon city sightseeing tour. Overnight stay at Eco camp. Morning after breakfast drive to Nameri national Park. On arrival check in at the camp/resort. Overnight at camp/resort. 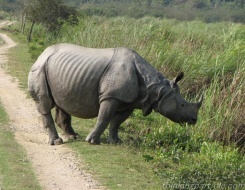 Kaziranga Wildlife Sanctuary , Nameri National Park covers an area of 200 Sq. Kms. With river Jia Bhoroli bifurcating the park, it is the most scenic of all the national parks of Assam. Its in the eastern border of Assam in the valley and mountainous Arunachal Pradesh, Nameri is home to some of the endangered species like white winged wood duck, Sloth Bear, Tiger Leopard, Clouded Leopard, Sambar, Gaur, Indian Wild Dog, four varieties of Hornbill and many other winged species. The other reason Nameri is famous for, is the herds of elephants. The park have a high density of elephant population and due to lessening of forest cover, they sometimes invade human inhabited villages, which have attracted the attention of wildlife conservationists worldwide. Morning after breakfast a guided trekking through Nameri Forest. Overnight at Camp. Morning after breakfast drive to Kaziranga National Park. On arrival check in at the resort in the afternoon jeep/elephant safari to the national to spot the one horn rhino and tiger. Overnight at wildlife resort. Morning and afternoon jeep/elephant safari to the national park for wildlife viewing like harbor swamp deer, Elephant, buffalo and the largest concentration of Indian Rhino. Overnight at the wildlife resort. Morning after breakfast drive to Guwahati, on arrival transfer to the airport time to board the flight for onward destination. Tour and Services Ends.